I know what he means. Do we just get worked up over new things so that we don’t feel like we’re being left in the dust? I don’t think so. But it’s a complex question, and I’ll undoubtedly bore and irritate you all by returning to it later. For now, though, let’s talk about some neat streams, lest you suffer the indignity of missing out. Full disclosure: two of the guys who play on this EP — bassist Erik Malave and drummer Alex Cohen — are also members of my band. I therefore cannot write critically about it in good conscience. However, I firmly believe that I’d like Imperial Triumphant even if I didn’t know any of them. Their brand of weird, dissonant black metal is right up my alley. Perhaps it’s up yours, too. Give it a listen and find out. 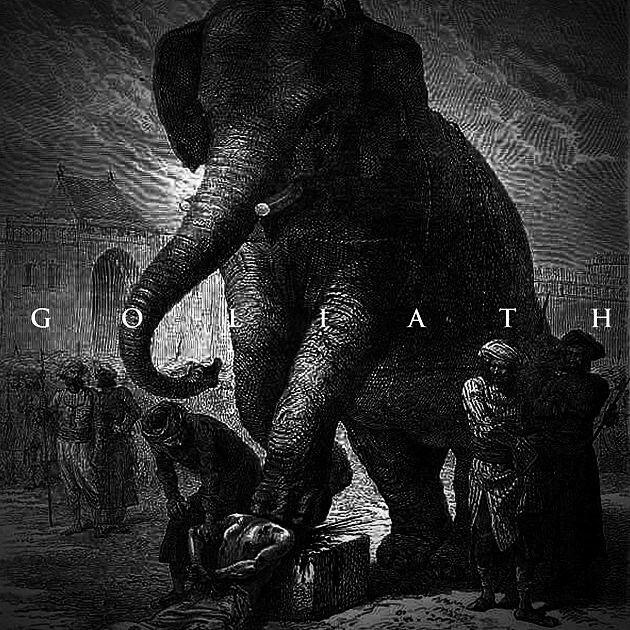 Goliath is available for download on their Bandcamp; we also debuted the Clockwork Orange-esque video for “Crushing the Idol” a couple of months back. This album has been floating around the internet for roughly a week, but I only got around to it today. Norway’s Blodsgard have been around for roughly seven years, but it’s taken them five of those years to put together Monument. According to Islander of No Clean Singing’s extensive review, much of that time was spent re-writing and re-arranging the album. The thought of second-guessing yourself about your compositional decisions for so long gives me indigestion, but the approach has paid off for this band. Monument is a thoroughly well-balanced black metal album — rangy but catchy, both clearly produced and satisfyingly gritty, and sweeping in scope without much exceeding the 40-minute mark. Its stern melodies, atmospheric stretches, and great vocals all remind me a bit of Nightbringer, though that comparison isn’t bang-on. Give it a listen above and decide for yourself. It’s available now through the Italian black metal label The Oath, though you apparently have to e-mail them directly to order it. Weird, but hey, that’s black metal for you. Cronian is a Bornkagar side project featuring both vocalist Vintersorg and guitarist Øystein Garnes Brun. They’ve debuted a song from their third album, Erathems, over at Brave Words and Bloody Knuckles, and apparently also at Terrorizer. This kind of keyboard-centric progressive metal definitely isn’t my thing, but people seem to go wild for just about anything that Vintersorg does. Justifiably so — he’s a great singer, no matter the context. Still, there are many things I don’t understand about this song, starting with the title. Is “Ecocracy” a real word? Is it a pun? Why do metal bands love talking about “-ocracy”s so much? I should stop before I hurt myself. Erathems comes out on November 12th in the US via Season of Mist.